As I was strolling through Foodland the other day, I noticed a three tiny bottles of barbecue sauce, really, there were only three. They were called Gunshot and since I am the queen of impulse buying, I threw one of them in my cart, checked out and went home. That night, I pulled out the sauce to go with the brisket I had been smoking all day. Sometimes my impulse buys are not, shall we say, successful, but occasionally, I get lucky. Gunshot Sauce was one of my big successes. I am not kidding when I tell you my boys almost drank the stuff. The flavor was not too sweet, not to spicy, not too vinegary. It was just right! Even better, I could pronounce all of the ingredients in the sauce: Vinegar, Tomatoes, Water, Spices, Sugar, Horseradish Root, Salt, Lemon Juice, Lime Juice, Celery Salt (Salt, Celery Seed), Onion Powder, Garlic Powder. 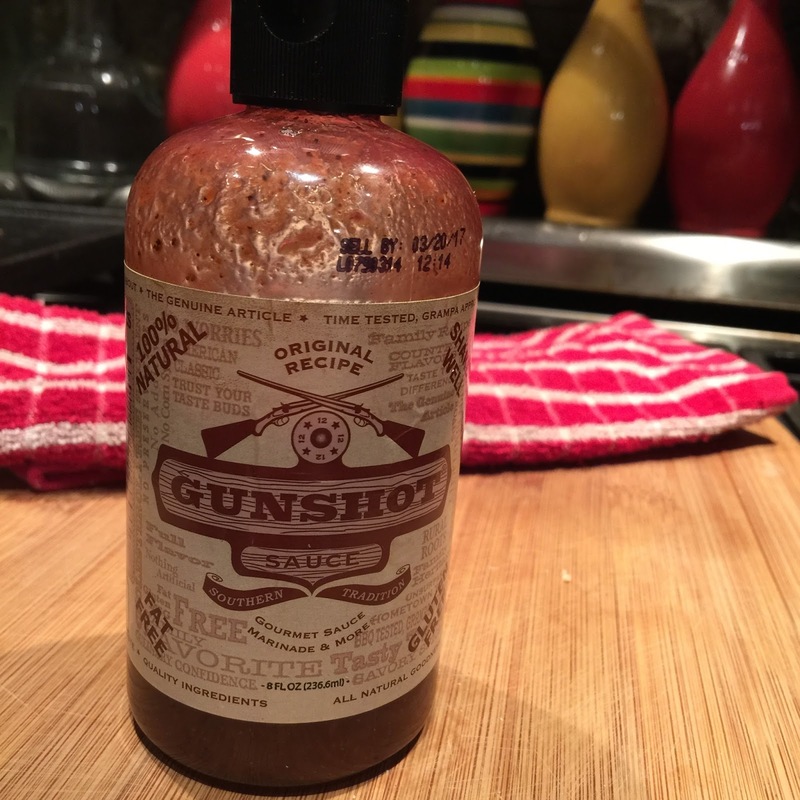 The Gunshot Sauce I bought was a in a small bottle, just 8 ounces, which, honestly, was one of the reasons I bought it. The little bottle stood out amongst all the larger bottles of sauce. The bottle may have been small, but the flavor was not. It was so big I contacted the company and promptly got a reply from company president and owner, Will McCarthy. I learned the company is located in Knoxville, TN. I explained that I had just bought a bottle of the sauce and I wanted to tell him how much we had enjoyed it. I explained that our local store only had three bottles the day I bought my sauce and I really was interested in making sure the sauce would continue to be available in my area. I had also talked to our local Foodland manager. Will was as nice as could be and thanked me for letting him know how much my family had enjoyed the sauce. He also sent me a link to his YouTube video giving a bit of the history of Gunshot Sauce. Apparently, Will's Grampa Wilford had an unconventional method for getting flavor into his pork. He used his 12 gauge shotgun to shoot sauce-packed homemade shotgun shells into his pork shoulders. According to legend, folks would come from all over when they heard Grampa Wilford's shots ring out. While Will is not recommending anyone shoot the sauce into your barbecue with a gun, he is now bottling his Grampa's secret recipe and he offered to give me two large bottles (16 ounces) of sauce to use as a giveaway. It turns out, the sauce comes in two flavors, original and hot and spicy. So here's the deal. If you would like a chance to win Will's Gunshot Sauce, leave us a comment below and, if you haven't already, go like our Facebook page. We will have a drawing on August 10. The winner will be announced here and on our Facebook page. And if you try Gunshot Sauce, please let us know what you think. What an interesting story. I would love to try the sauce. I hope I win Will's Gunshot Sauce. It sounds great! Dyana, we just had the drawing for the Gunshot Sauce and you are the winner. Please send me your address so we can get your prize to you! Congratulations! I'll take the hot and spicy, please. Funny back story. The hot and spicy is spectacular on fried chicken wings, shopping for more, to win some would be great, looking for more sauce in Florida.